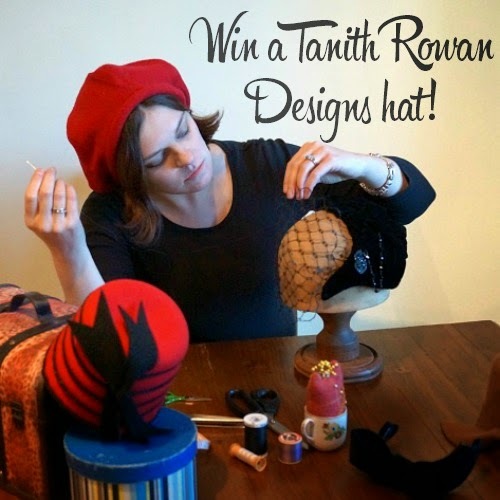 Win a Tanith Rowan Designs Hat in my First Competition! It's here! My first competition/giveaway, and I'm very excited. 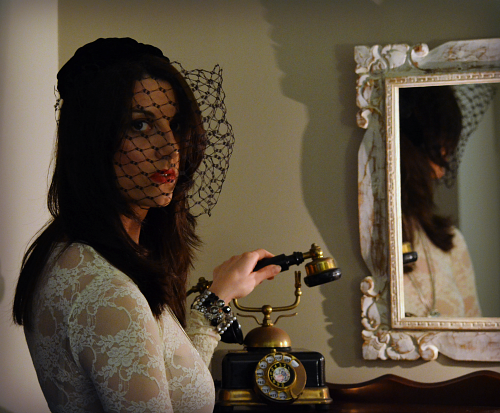 I get a big kick out of seeing my hats find their way into the world and come to life on a wearer who will love them. I'm going to give away one of the hats that is currently available in my online shop. 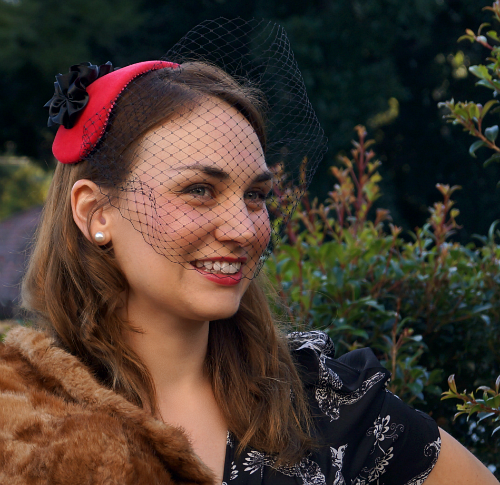 You will find a range of my work there, including vintage-inspired hats from the 1920s to the 1960s, costume hats inspired by older history and imagination, and modern pieces suitable for a day at the races. Go and have a look at what's on offer and think about which one you would love to have for your own head. The prize will include postage to wherever you are, worldwide. I have assembled a judging panel that includes myself and a number of members of my family. We will each vote for our favourite entries, and the votes will be tallied to detemine the winner. The winner will be announced on this blog on Friday 15th August and will then need to contact me with their address. I am willing to post to anywhere in the world, but please use your superior knowledge of your country's import restrictions and customs requirements and choose sensibly. Some hats do contain animal products (e.g. feathers). My family members are not eligible to enter. For goodness sake ask for something for Christmas. You might have noticed that I didn't make you like or follow me on any of my social media places, or envy products on Storenvy or anything like that. I don't need followers who don't really want to follow me! But if you are here for the first time, please do look around the blog posts and the gallery and have a think about whether you like my work and want to keep in touch. Please share this giveaway! It would mean a lot to me to have heaps of fun entries to read. Whether you want to tweet it, share on facebook or instagram, or just mention it to a hat-loving friend, that would be much appreciated. Good luck to everyone who enters! Have fun with your answers! 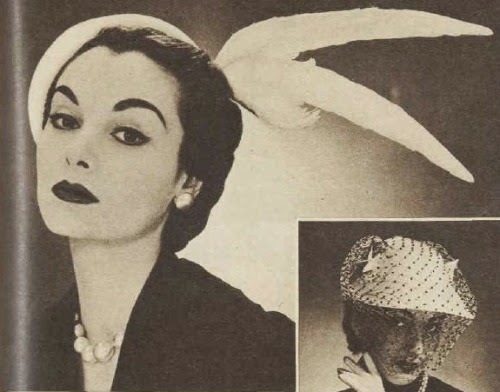 I had a lot of fun with my post on Millinery Trends of the early 1950s, and only got up to 1952, so I want to travel a little further with this post. There were many images and quotes to choose from, but here are some of my favourites. 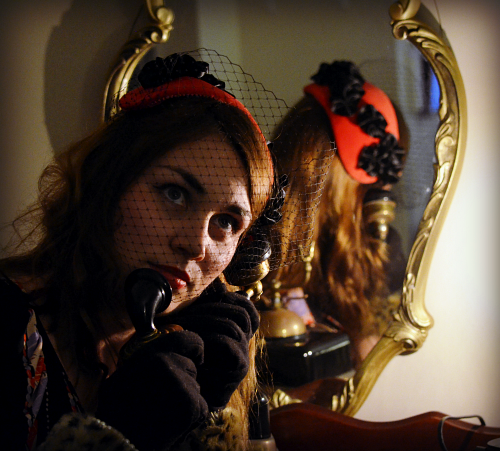 I am saving some for an upcoming collection of millinery tips and hat-wearing advice as well as some pattern reviews. "Parisians can pack half a dozen hats into a paper bag this summer...The head-pieces are so small they are almost non-existent. 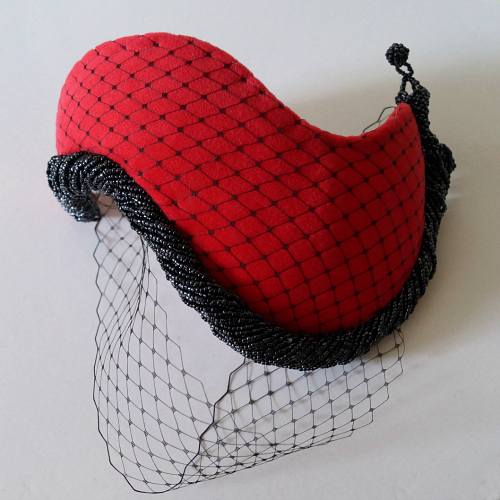 Skull-caps, pill-boxes, mushroom-berets or high, cone-shaped crowns - anything goes so long as it is small and untrimmed except for an occasional feather or heavy mesh veil." Small and minimally trimmed is the main trend I've seen in all the articles and photos I've read from these years. 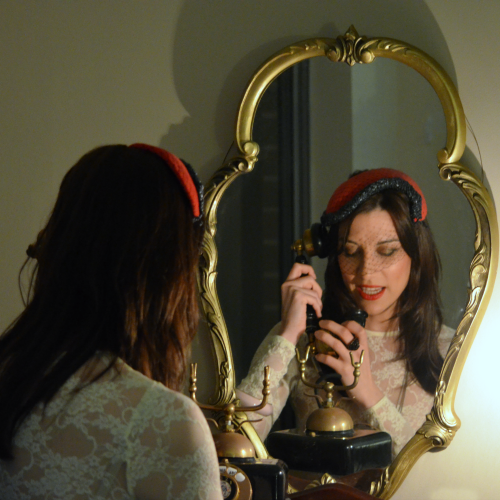 "Hats in Paris this spring are mostly half hats, and many are little more than ornaments. This ornament hat in black velvet curled in horn shapes mounted on gold braid is by Fernand Aubry." They may be little more than ornaments, but what an ornament! An unusual but elegant hat, in my book. The same issue, says that "The New Hat Silhouette is Varied". 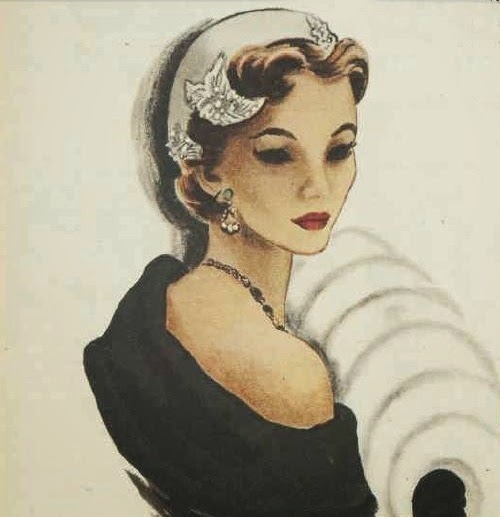 The black hat above is from Dior, a "head-hugging velvet bonnet" finished with two tassels. The blue is from "Svend" in velour. Also mentioned - "Jacques Heim's collection includes a number of hat and muff sets." 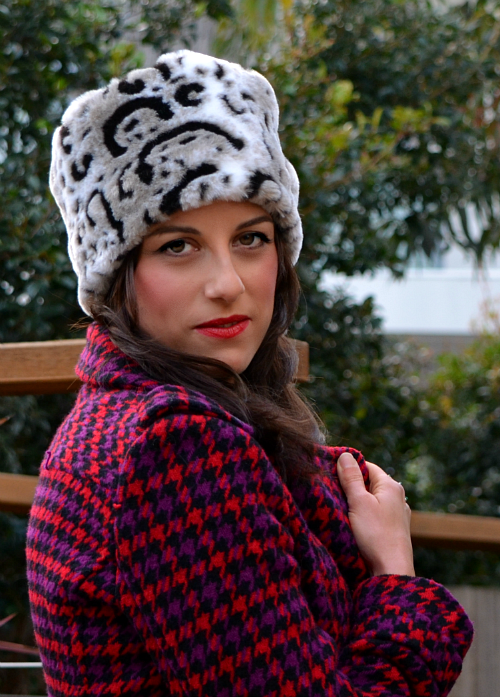 Further justifying the matching hat and muff suggestions for my snow leopard fur situation! The blue below is from Madame Vernier in turquoise felt with black grosgrain ribbon band and black feathers at the back. I have an aqua blue felt that just arrived last week and now is calling to me to become a version of this hat. Below is a Lilly Dache hat demonstrating the trend for white hats. "Presenting the luminous white hat, so exactly right, as a forerunner to autumn. The silhouettes are fresh yet sophisticated. Veils are worn in new ways, with one purpose - to make you look prettier." "And - although the voice of the Federal Treasurer is heard in the land - a young woman's fancy seriously turns to a new spring hat." "Any day from now nearly every woman will discover that the cost of living is not so bad that she can't afford to run up a printed cotton at home. And the best thing to do when your head is full of taxation figures and budget calculations is to put a new hat on it." This issue includes a spring fashion supplement reporting that "Accents are feminine". This circlet of flowers below is "for late-day or evening wear" and it "is designed to be pinned to the back of the coiffure and fitted like a cap." 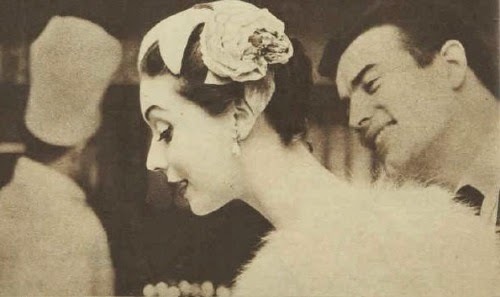 The February 11, 1953 AWW quotes an American millinery retailer, Mr. Max Hess, who says that men need to be educated about women's hats. Through their ignorance of hat fashions, and conservative tastes, many thousands in hat sales are lost each year. However, he does suggest they act as a restraint on the whims of designers, who would take things too far without this restriction. "So, all in all, it is just as well that somewhere in the background there are always men who say, "If you wear that thing it won't be with me."" On April 22, AWW shows new hat sketches, including this cap of white satin. 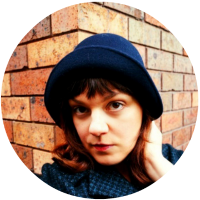 "Autumn hat silhouettes call for a new hair shape because they just cover or only partially cover the hair, rarely extending beyond the hairline. In place of the boyish haircut is a halo-like coiffure which frames the face softly and leaves the back hairline neat and chic." "Dior's new cap made from clusters of berries and fruits look newer than the flower cap that has been a successful piece of millinery flattery for several seaons. The new fruit cap is designed with a widow's-peak point on the forehead." A fruit hat is something that is on my to-make list. My eye is always caught by vintage millinery trims in the form of fruit, which often come up on etsy or ebay, but I'd also like to try and make my own. 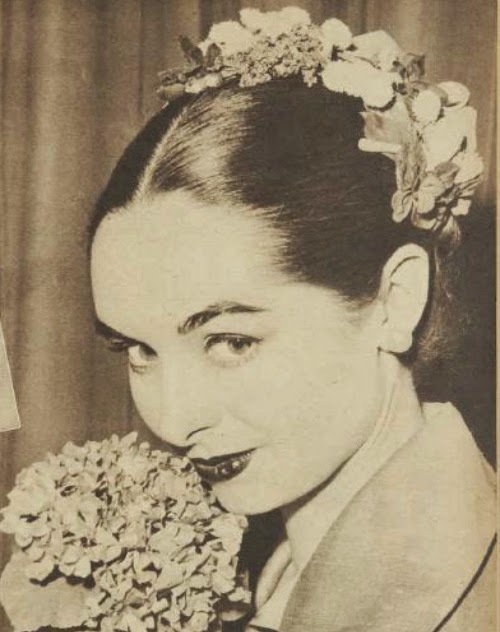 Hats, apparently, would continue be small in 1954, with the exception of the coolie, a gorgeous example of which is shown above. I always think of the fashion parade in "How to Marry a Millionaire" when I think of 1950s coolie hats. 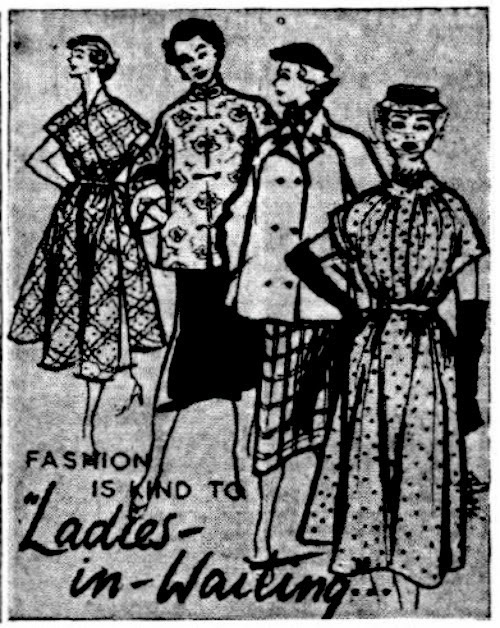 On February 7, 1954, the Sun Herald's hat fashion advice was all about pillboxes "with a difference" that would be a top item for 1954. "They will be shallow, worn very far forward, made of rich materials, and often trimmed to glitter." Above is an evening cap of rose satin in petal shapes with a silk rose and green leaves. 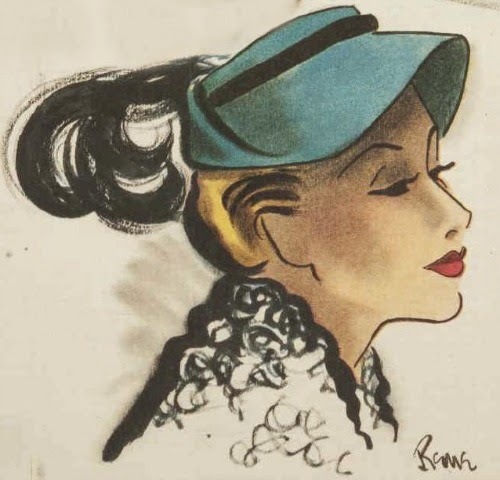 "Like numbers of Paris hats, the model is designed to show the coiffure." This is a big theme of the year's hat fashions. 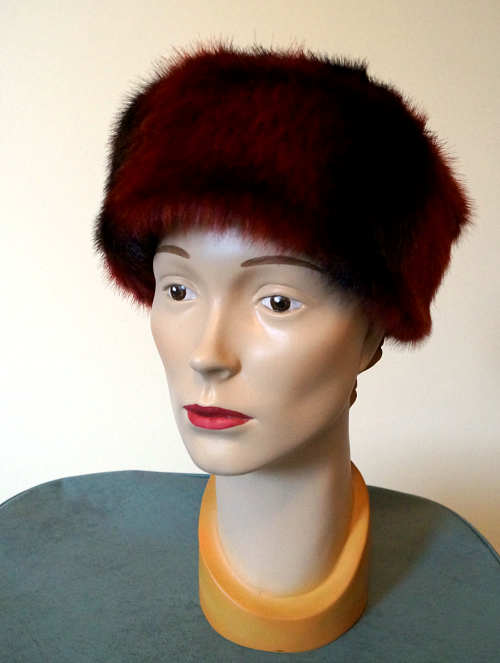 "The milliners of Paris have pared down autumn hats to chic little shapes designed to complement a short-cut coiffure. The hats are worn in a new way to expose the hair becomingly - at the sides, back and often the hairline." In a way, the hat fashions seem a lot more focused in the 1952-1954 period than in 1950-1951. Hats are mostly small, although the shapes vary. 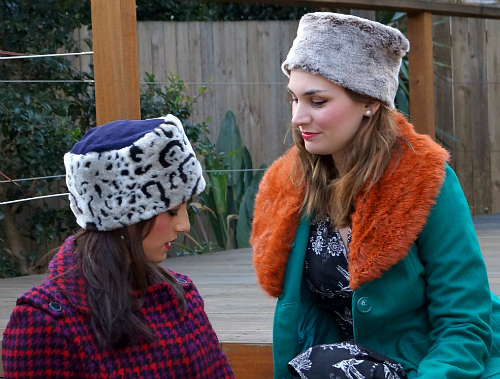 Half-hats/skull-caps are popular, but still take on a range of looks from their fabrics, colours and trims. Trims vary, but are often understated, or at least kept to one standout feature trim. The small size of that hats allows hairstyles to be shown off, especially shorter hair with cute curls at the front and at the neck. How do you like the trends of this period? 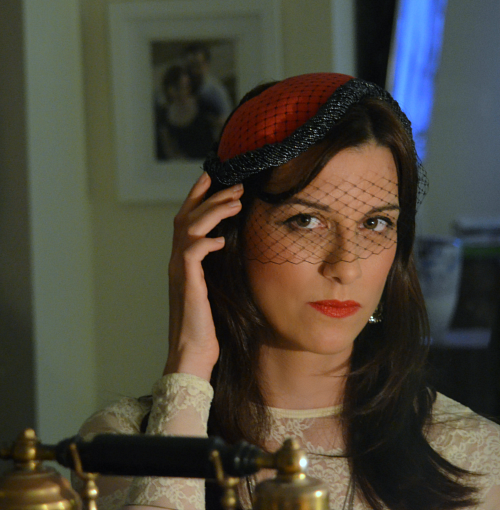 And which of these delicious hats would you dream of adding to your closet? 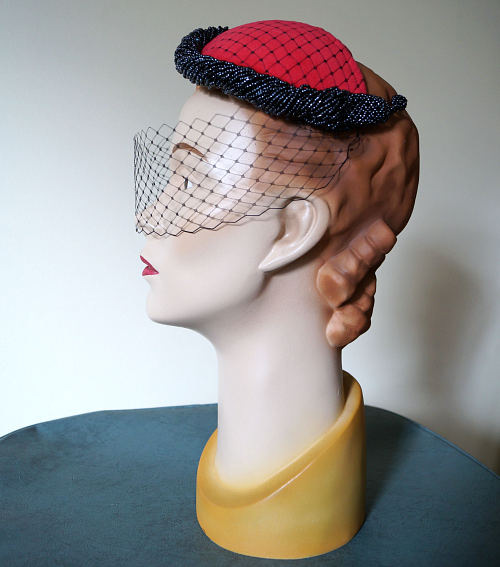 The previous little 1950s hat in cherry-red velvet was the product of a millinery class and doesn't display as much of my personal style as the ones I have made (and am currently making) in a similar style since. Like this one! Using the same lovely rich red velvet, this time the foundation shape is a bit more curly. I wanted to keep using veiling, but play with it in a different way. 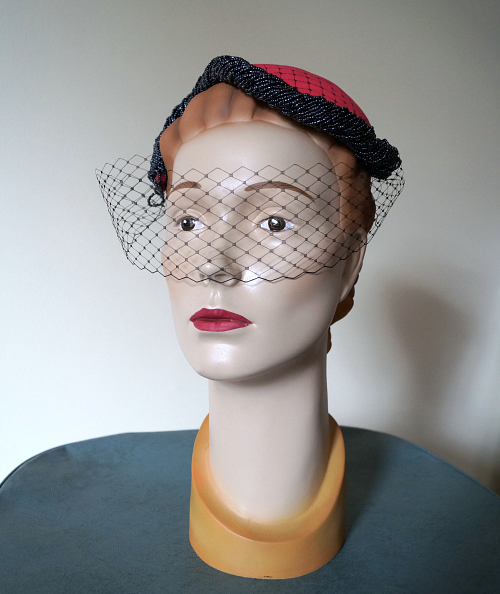 I've overlayed the veil over the main hat body, and also added a thin band of veil, like the one featured in an Australian Women's Weekly photo from my post on millinery trends at the start of the 1950s. The other trim I added is a twist of beads along the front edge. This is actually a second-hand bead necklace that I twisted and twisted into a tight rope. If you follow me on Instagram, you would have seen this in progress, when I was still trying to decide on the trims. I thought I wanted to add more to it, but once I saw it on a real person, I knew I was happy with it the way it is. 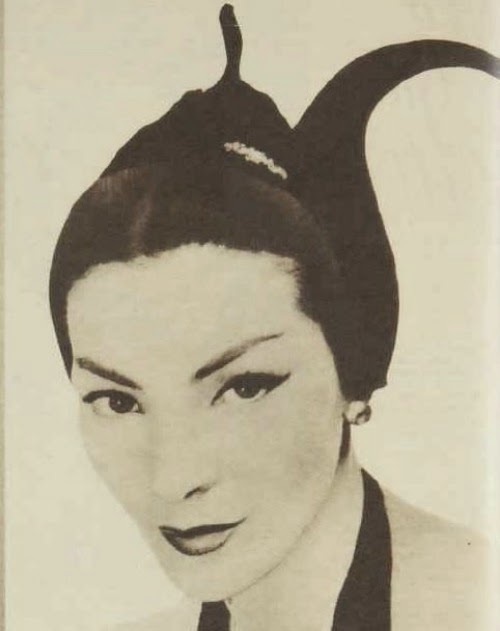 This kind of hat - very small, fitted to the head, usually without large trims, but usually with veil - was very popular in the 1950s. You see a lot of images of these around, but I've seen them called a few different things - demi hats, half hats, cracked egg hats, skull-cap hats. 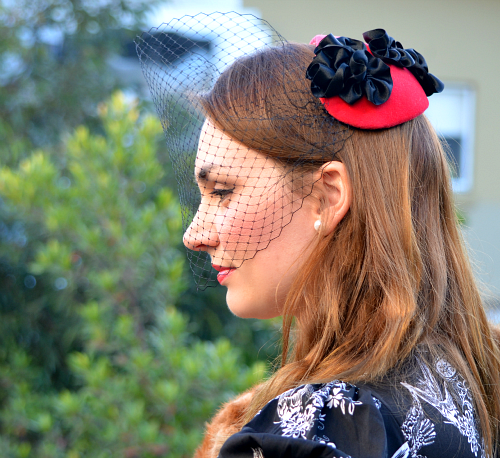 They are often described in sales listings as cocktail hats or fascinators because they are small, and often have an "evening" feel to them, but there are also many "daytime" looks. 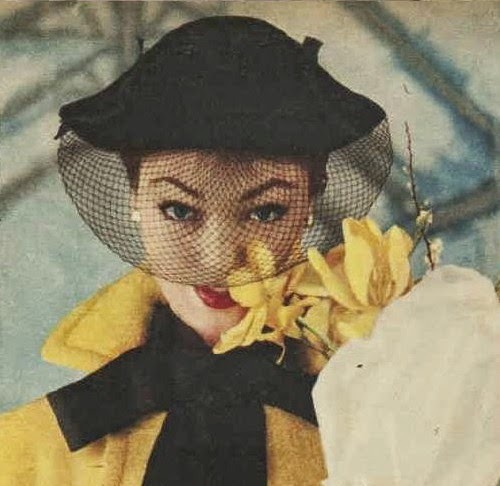 There are a lot on my 1950s Pinterest board, among a range of fifties hat images, and JudithM Millinery has a board dedicated specifically to "Half Hats and Cracked Egg Hats" that is worth checking out as well. 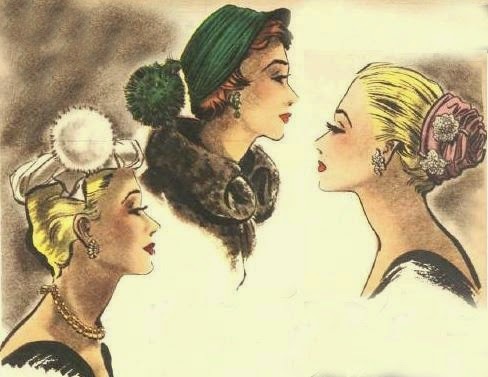 I know a lot of vintage fashion lovers have some amazing hair-styling skills, and a great thing about these hats is that you can still show off lots of styled hair. They suit having some fun curls at the front then more at the back below the hats, but also go well with simple and understated hair. They are fun to make because it can be all about the trim, and suit a huge range of trim types, including (but definitely not limited to) flowers, beading, ribbons, bows, drapes and pleats of fabric and feathers. In other news, I'm very excited to be currently preparing my first giveaway, which is going to be starting next week! So make sure you check back for that. It's going to be fun. 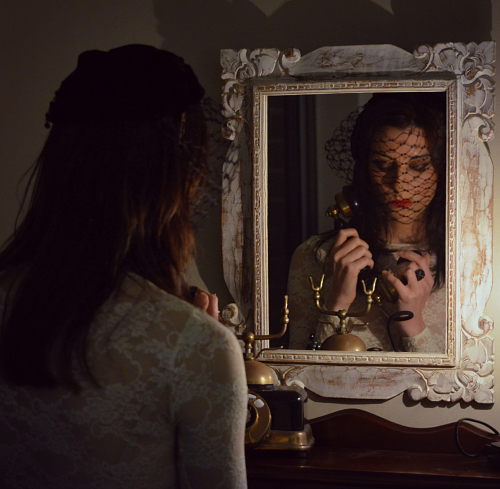 After the natural light outside faded, we were still excited and keen to take more photos, and had a gorgeous vintage telephone and a mirror to play with, so we kept going. We managed to do a lot better in this artificial light than we expected. The detail of the hats, especially the all black one, don't show up too well, but the overall effect was wonderful. As a lover of the slightly-creepy, I was very inspired by these images. Although I don't care for all-out horror, especially gory things, I love things that are subtly unnerving and shiver-inducing. I read old ghost stories and classic murder mysteries, and I'm slowly working my way through Hitchcock movies. As we took photos, stories started to unfold. Each photo inspires me with multiple ideas. Is this a grieving widow adjusting her veil, or a sorcerous witch about to raise her eyes and weave a curse? They feel like stills from a thriller movie. Does she still have time to call for help at this point, or has she left it too late? 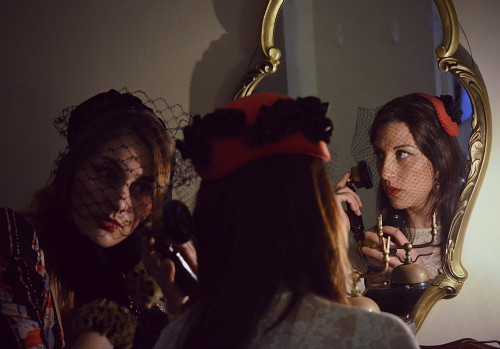 Taking these mirror shots was fun and fascinating. 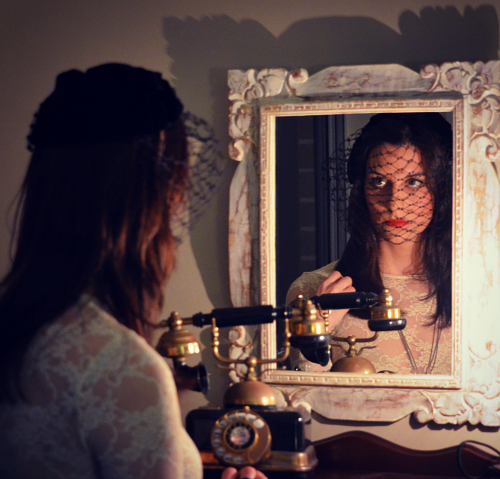 I had a go at taking photos in this shoot, and the camera would sometimes focus on the reflection, and sometimes on the real person. Most of these successful shots were taken by Mel, with me styling and directing from the sidelines. I love everything about this shot. 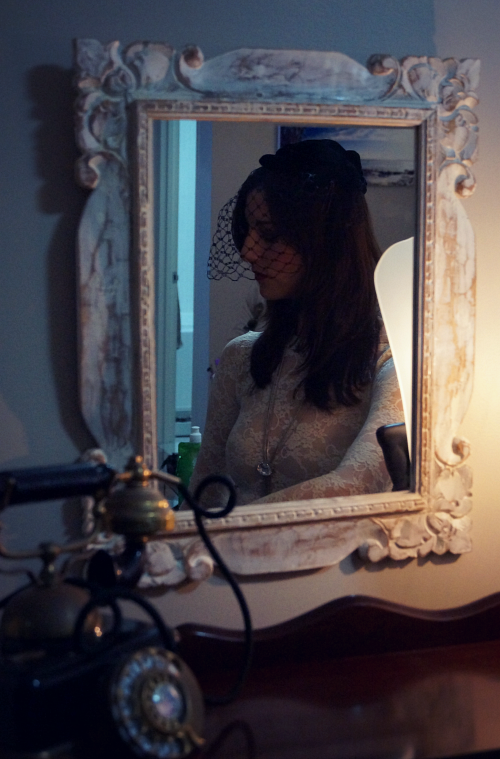 The wing-like shadows from the mirror, the perfectly frozen moment in time and the intense look on her face. I'm pretty sure her reflection means her harm. We also got the red velvet hat into the action. I love how beautifully the front and back detail can be seen at once in this shot, and the tight grip of the gloves on the phone. While editing these (I use picmonkey) I couldn't resist playing with effects, including some from their various Halloween themes. Is Dee shocked at discovering that Mel has been listening to her conversation, or has she just heard something that will upset their plans and is silently conveying this? I'm pretty sure this is a poster for a movie about two sisters, but I don't know if they are in it together, or if it is about the evil sister plotting against the other. Here is the black hat in the daylight, where you can see the detail better. 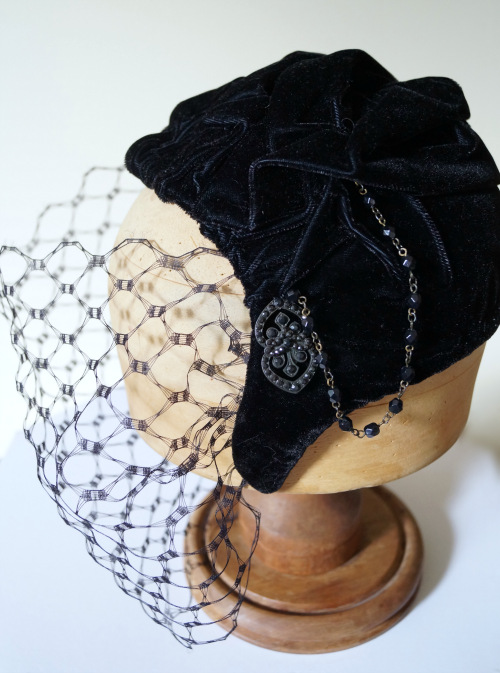 It is covered in ruffled black velvet, with a full-face black honeycomb veil and a dangling chain and pendant on the left side, which drops lower and further forward than the other side. 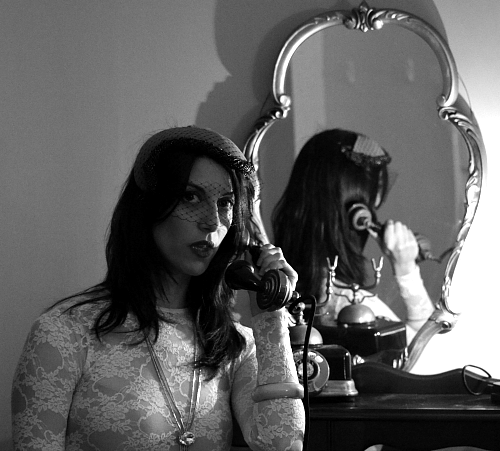 We enjoyed this so much that we are planning to do a thriller/film noir/Hitchcock inspired shoot again. I've started a Pinterest board for photoshoot ideas if you are interested. I'd love to hear any ideas for spooky photos that you might have. I have a number of fabric weaknesses. Fabrics that I just love, and find it hard to resist. Faux fur is one of them. Many (many) years ago I went on a fabric-buying binge and I still have a lot of fake furs in my stash from that time. At one point, Lincraft had a massive sale and I bought 3 metres of that fake snow leopard fur! Let me tell you that 3 metres is going to make a lot of hats. 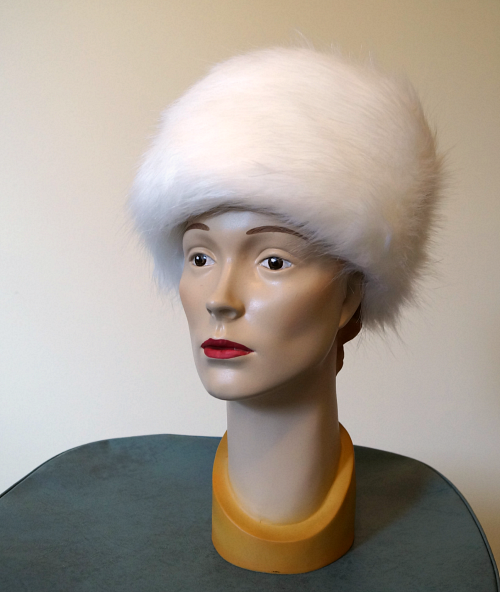 I do love cossack style hats, as you may have noticed before in my 1960s faux fur hat post, and with winter getting serious, they were the perfect project. I mixed things up with other fabrics for the tip and faux fur for the sideband. This snow leopard one has a purply-blue velvet top, and I matched a black fur fabric with a grey wool plaid. The snow leopard is my favourite of these fabrics. As well as being so visually striking, it is super soft and nice to work with (for a fur fabric!). I'm in the process of making myself one of these to wear for the remainder of this winter. 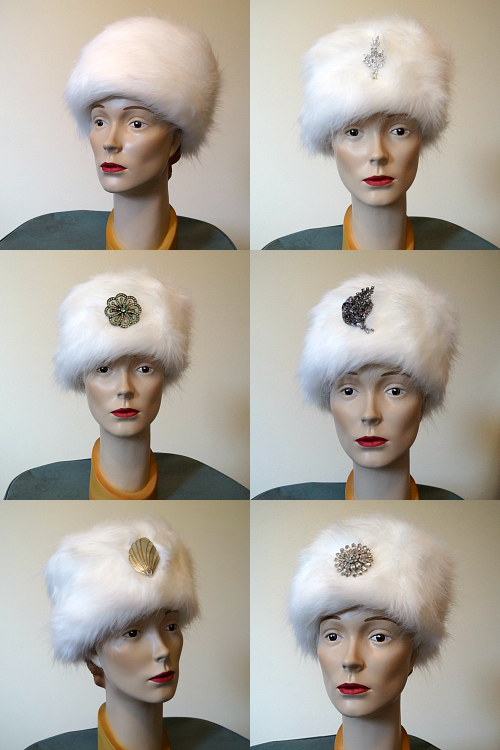 As I mentioned in my last post about the 1950s hat, I have some hats in a bricks-and-mortar shop now, and that includes these cossack styles. 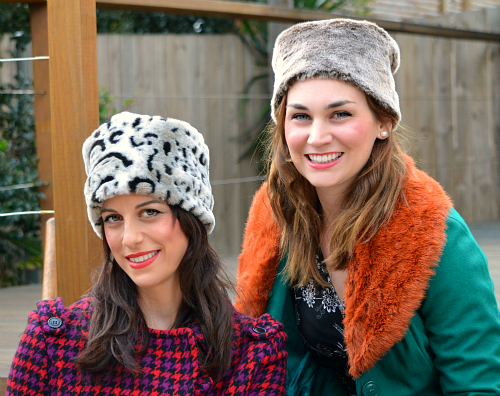 The blue mountains winters lend themselves perfectly to some seriously warm hats! The grey one shown in the pictures above has already sold. Here is my little display. I'm pretty pleased with it, and they provided the cute little mirror. I've also got a few more currently in-progress on my sewing table. They are mostly at the sewing-in-the-lining and neatening-up stages. 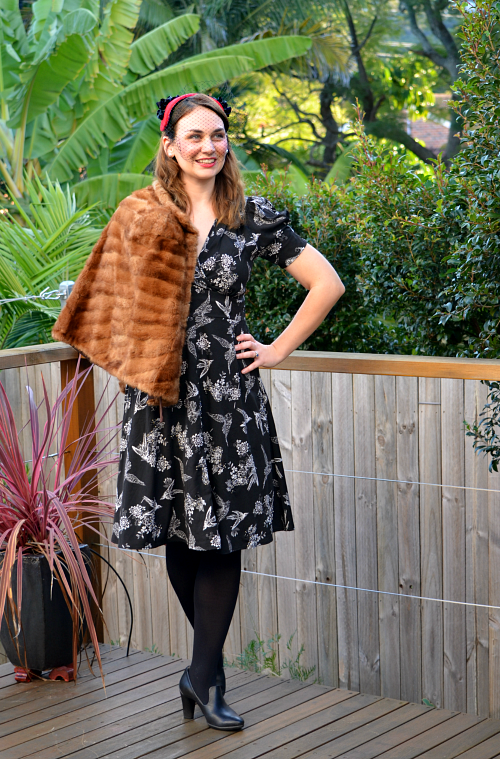 I treated myself to some new faux furs recently, including this mottled red and black. 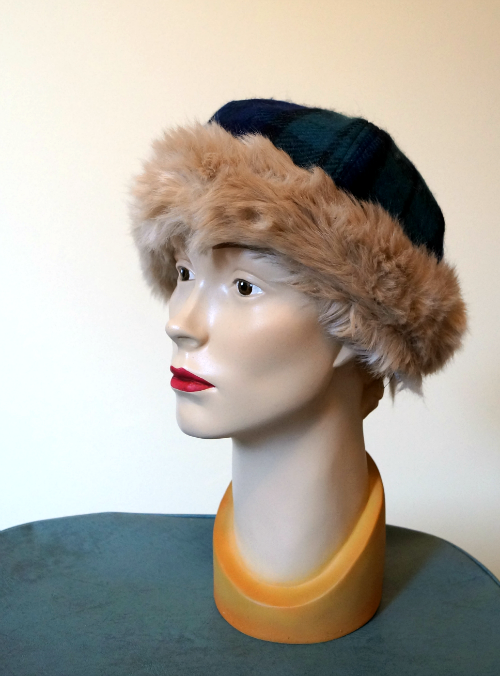 This fur-trimmed beanie style is made from a second-hand scarf in a tartan print (Black Watch, I think?) and a fur trim I bought a massive roll of second hand at a market. I couldn't resist going all out on a seriously winter-princess fluffy long-pile white faux fur. Who could resist, right? At the moment I'm stuck deciding on bling for it. It is impressive plain, but I think that when you go all out, you should go ALL OUT. And that means sparklies. But I have to decide which one. I fear that my favourite bling is the one I can't use unless I keep the hat for myself, because it was my grandmother's! But I could try to find something similar. I'd love to hear your opinions on the white hat. Bling or no bling? Which bling is best? 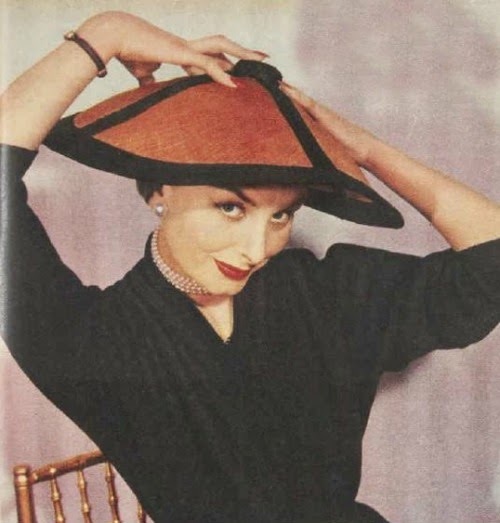 Finally, on with the 1950s in my "Hats of the Past" blog series. I recently spent a day with an old friend and making a new friend, over an amazing photoshoot. I've been sharing sneak peeks on the Tanith Rowan Designs facebook page and also on my instagram, and now I'm ready to start blogging the photos too. 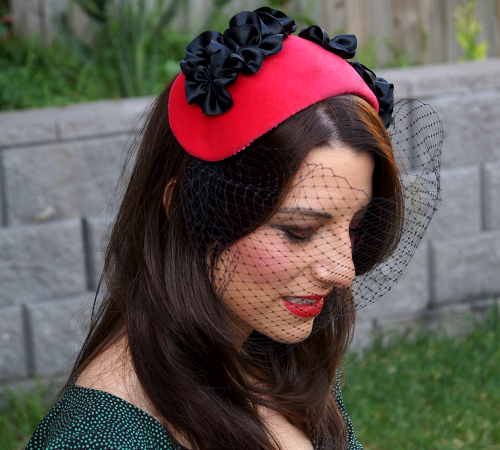 This is the cherry velvet "demi" hat that I started in class with Joanne Rolfe of Vintage Designs at the International Millinery Forum in January, which I talked about at the time. 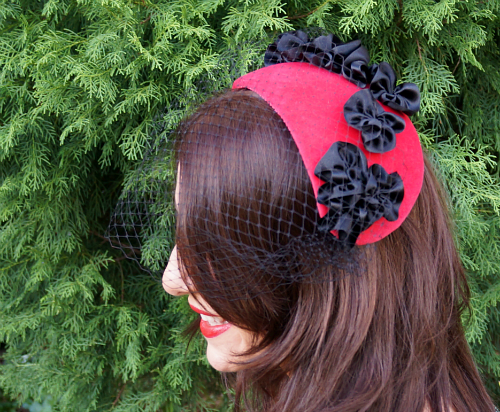 I love the combination of the cherry red velvet with the black ribbon flowers. 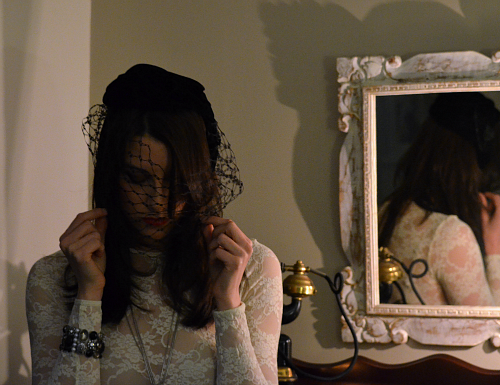 And I am so in love with the difference a veil can make to the impact of a hat. Today is the first of many posts I'll be making from this shoot. The number of gorgeous photos was overwhelming, and it is taking me a while to sort through them all! It was a shoot where everything just went right. The light was perfect in the day, and as you'll see next week, even after dark we had surprising (and slightly creepy) success. I feel very lucky whenever I see my hats come alive on a real and beautiful person as part of a well-put-together outfit and in a nice setting. Hats really do complete a look, and they themselves blossom when worn. 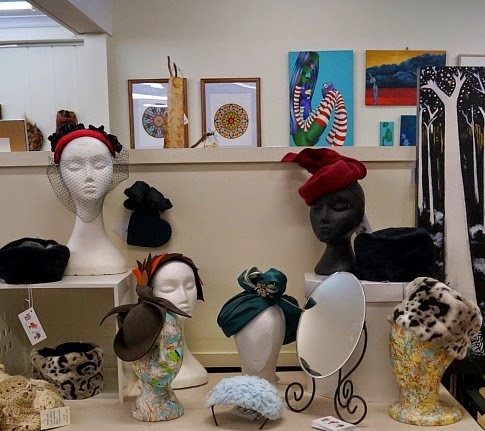 The other recent event that I'm excited about is that my hats are back in a bricks-and-mortar store. I have about a dozen hats, including this one, on display and for sale at The Blackheath Hub. This is a new shop featuring many local arts and crafts, in the next village to mine (super convenient!). If you are lucky enough to be in Sydney or the Blue Mountains, you should go and see all the great local work available here. And if you can't find a cafe you like in Blackheath, I'd be very surprised! So this one won't be in the online shop but you can always let me know if you are interested, or of course I can make this style up in a range of colours, fabrics and trims. 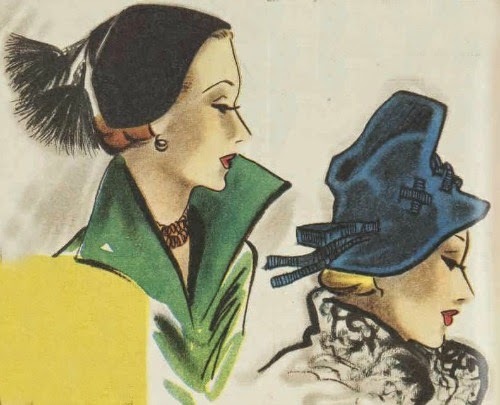 I'll be sharing more small 1950s hats in the coming weeks, so if you like this look, you have something to look forward to! 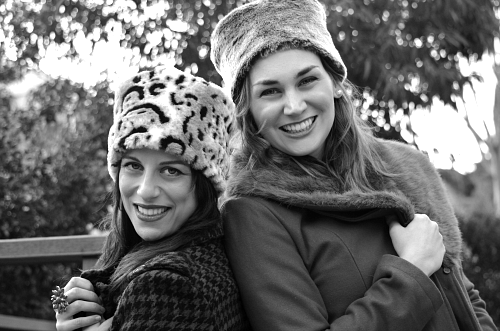 Thanks to my lovely models/make-up artists/photographers, Dee and Mel! What do you think? 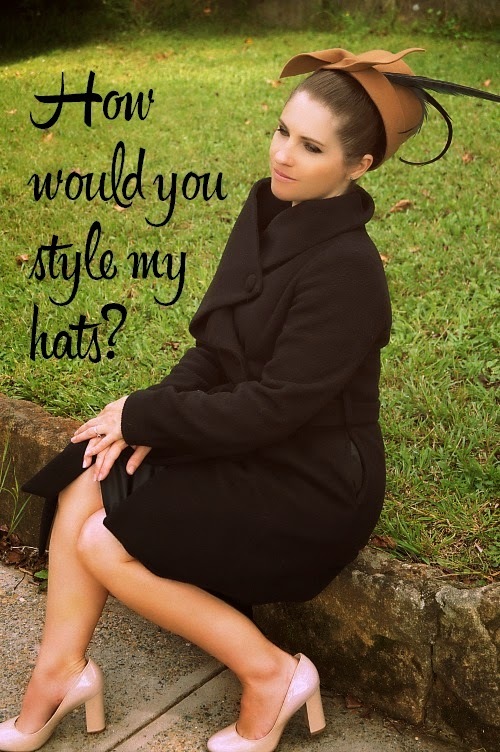 Are you a fan of this cute little style of hat? After getting too big for my jeans by about week 10, I've spent a fair bit of time thinking about maternity fashion. Since I wanted to get a bit more into vintage fashion, one thing I looked at was vintage maternity clothing. 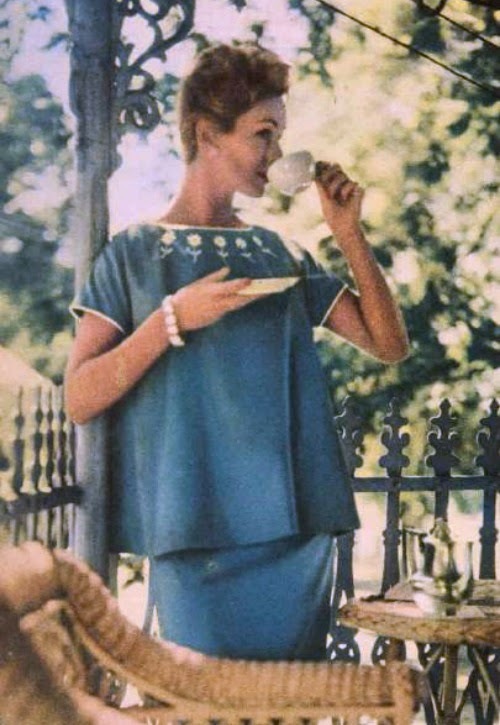 I was hoping to find some good outfit posts by vintage fashion bloggers, showing how they adapted a vintage look to maternity wear. There wasn't as much of it as I hoped, but I did find some cute inspirational outfits. I have a Pregnancy Fashion Pinterest Board, it features vintage- and modern-style maternity outfits and some vintage patterns for inspiration. 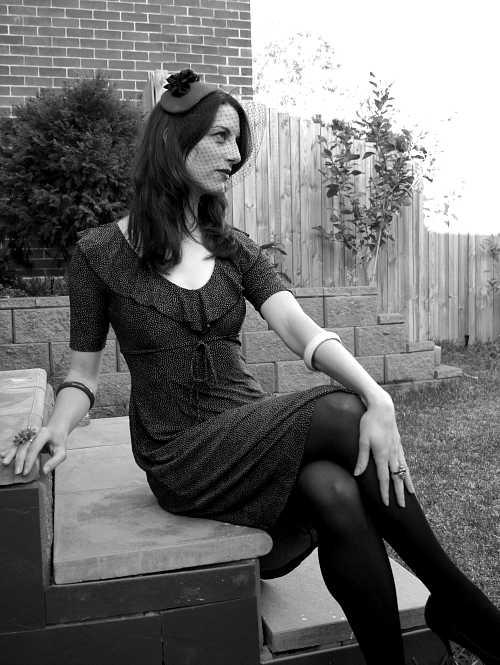 Today I'd like to share with you some images I found on Trove and Flickr, and talk about how I feel about maternity fashion and the different approaches to it in the past. 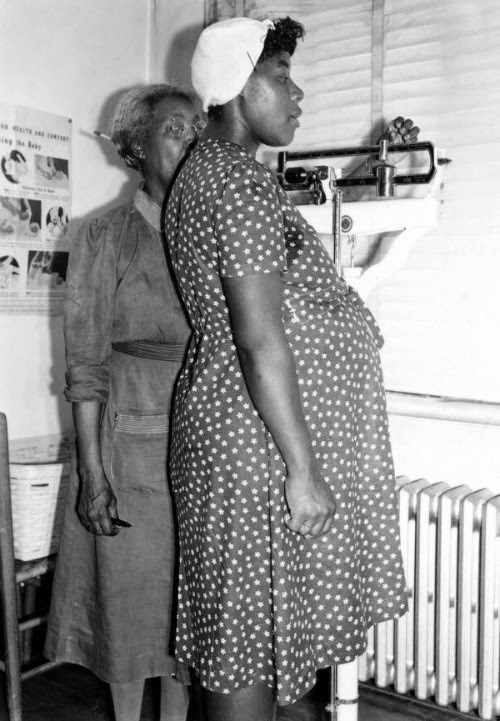 I won't go into too much detail about maternity wear history, but I do have some links about that to share if you are interested in more information. The general trend of maternity fashion history is that things look pretty sparse in the early 20th century. Mentions of pregnancy are pretty rare, and hiding it was a primary focus. 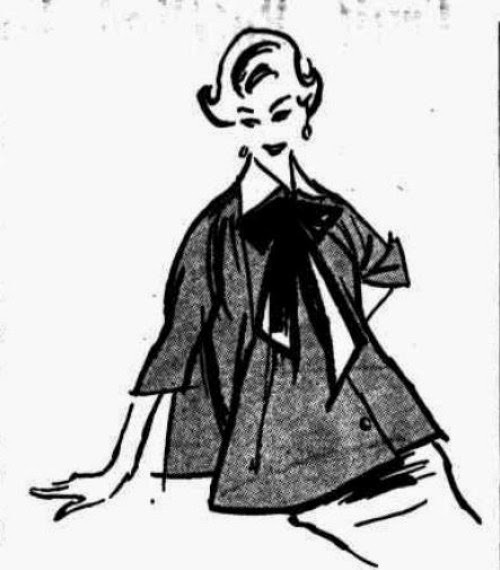 This illustration comes from an article talking about the Latest Fashion, and only once mentions that this Dressing Jacket is for a maternity outfit. "The style illustrated is a dual-purpose frock. It has been planned to provide comfort and style during maternity, and is suitable at all times for wear by the well-dressed matron who is inclined to fullness. The cross-over effect, with its single button fastening will be welcomed. The panels bring the necessary slenderising influence." Many people prefer these styles over later, more voluminous maternity designs. I agree that they look much better, but the problem I have is looking down at my ever-expanding form and then looking at the dress. I can't see my large pregnant self in that dress, let alone looking any good in it. The problem with the photographs and illustrations of the time not showing women who actually are or look pregnant, is that I can't see the dresses as really suited to maternity. I had to share this, as one of the few photos I found of an actually pregnant, everyday woman. This is from 1944, and shows a weigh in during a health check. You can actually get a feel for how the standard dress style of the era looks when worn over a very pregnant belly. Fashion illustrations just don't give you that. And she's wearing a cute hat. "For years we've complained of the poor style and high price of maternity dresses and at last the manufacturers have woken up to the fact that women want something right in the front line of fashion to wear, during the long months of waiting for Jimmy or Jane! Just knowing that you still look elegantly trim makes the queue at the clinic seem shorter, and your own special D-day not too depressingly far ahead." She goes on to describe the fashion options in detail, the materials, what occasions to wear them to, and so on. Still, however, much of the time her focus is on how to keep "your happy secret" to yourself. 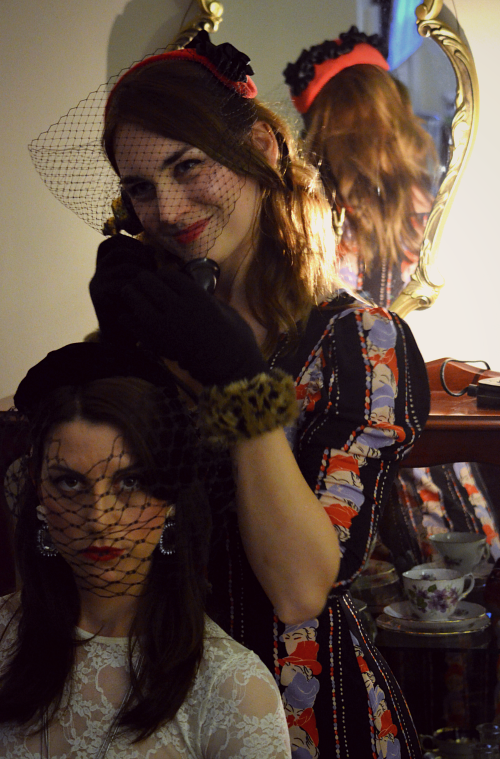 "We do not want to go out with our husbands after dark only - like the dog being exercised. We want to look attractive up to the last moment. And it can be done, if we can get the clothes." The article accompanying this sketch describes a failed search for maternity wear in the UK, and how similar the situation is in Australia. 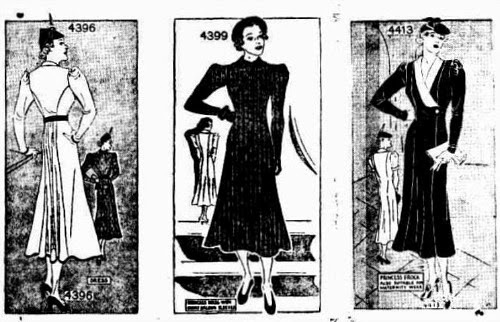 The comparison is made to the styles readily available in America, which are roughly sketched but described in great detail, to inspire "the Australian home dressmaker". The one I've shown above is a tomato red cotton jacket with a white collar and a navy outsize artist's bow. Also described is an outfit that includes green cotton jeans ending in a tie just below the knee, with an expanding waistline, worn under a smock top in pink, white and green printed cotton. By the late fifites, maternity fashions were starting to get their own spreads in the Women's Weekly, with patterns available to order, and some photography that does the fashions justice (although I doubt the models are actually pregnant). "Color is a staunch ally to morale in pregancy. Light colors do not necessarily have an enlarging effect; intense reds, blues, clear whites are flattering." I had to include these pictures from 1960. What a contrast there is between these outfits! A fun beach suit showing lots of leg and a conservative outfit that includes little white gloves. I'm not sure I'd feel confident in that beach suit (even if my pregnancy wasn't straddling winter) but I do think it is adorable! 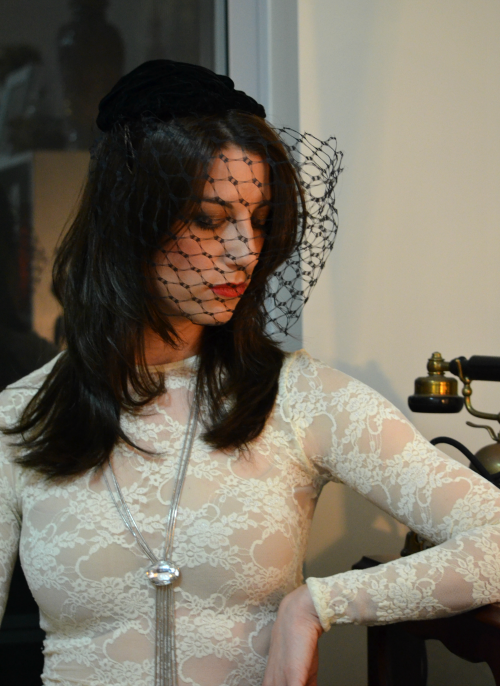 Building a Vintage Wardrobe: Retro Maternity, at Va-Voom Vintage. Brittany offers a guide to vintage maternity styles and how you might like to include them in your wardrobe. 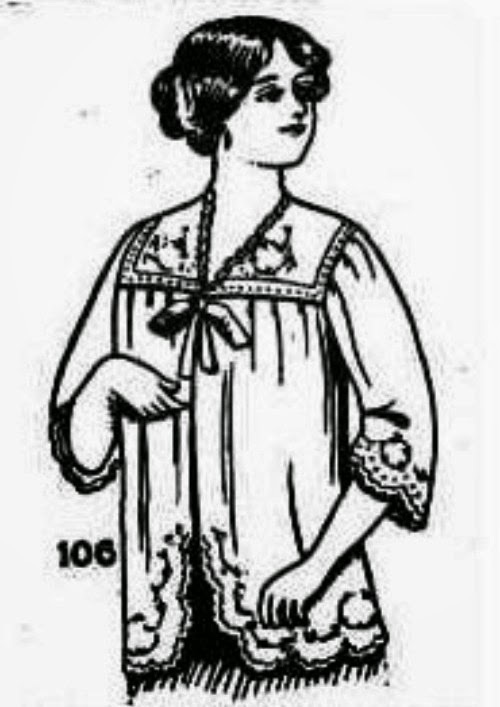 Vintage Maternity Clothes History, at Vintage Dancer. A detailed look at the development of maternity fashion from the 1920s to the 1960s, with great photos. 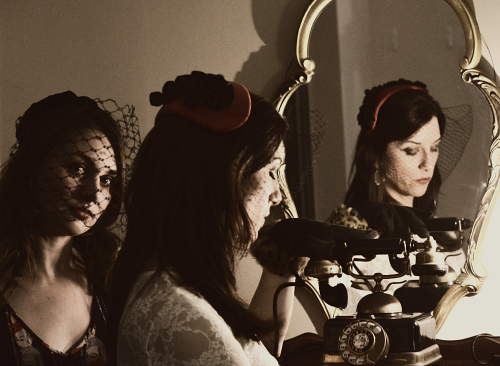 Pregnancy Body Image and Vintage Maternity Wear, at 3 Hours Past the Edge of the World. A round up of more links and thoughts on how to handle the effect that losing your shape has on your self-esteem and body image. I have to say that I am happy to be pregnant in a time when it is socially acceptable to show off my bump and let it be obvious that I am in the family way. I do think that some of the vintage styles are fun, however, and intend to draw inspiration from them for some of my maternity dressing. What are your thoughts on vintage maternity styles? Which era do you like?